Zool is a British computer game originally produced for the Amiga by Gremlin Graphics as a rival to Sega's Sonic the Hedgehog. 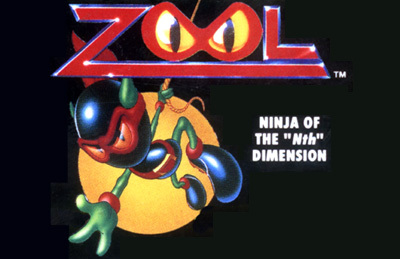 Zool is "a ninja from the nth dimension" who is forced to land on Earth. In order to gain ninja ranking he has to pass six lands. The game is a pure arcade platform game, relying on smooth, fast moving gameplay, colorful graphics and a popular soundtrack. Zool contains a number of embedded games, including several arcade games, a scrolling space shooter and a game accessible only by making Zool play a certain tune on an in-game piano. A Zool coin-op was released in 1993 to cash in on the hype surrounding the Amiga release. It was not well distributed and is now not widely remembered.